What do you do when you have bagful of homegrown mangoes? I know choices are endless. 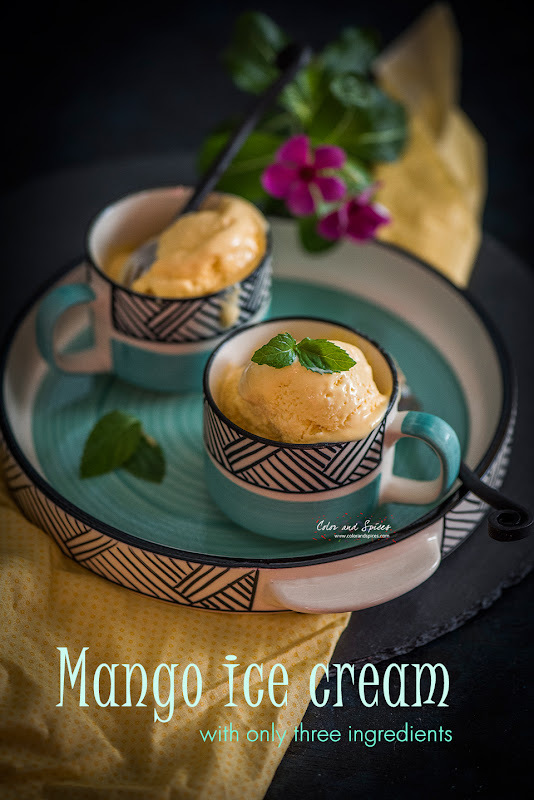 Other than enjoying the mangoes as fruits I have also prepared different kinds of desserts using them. Here is the easiest one I'm going to share. 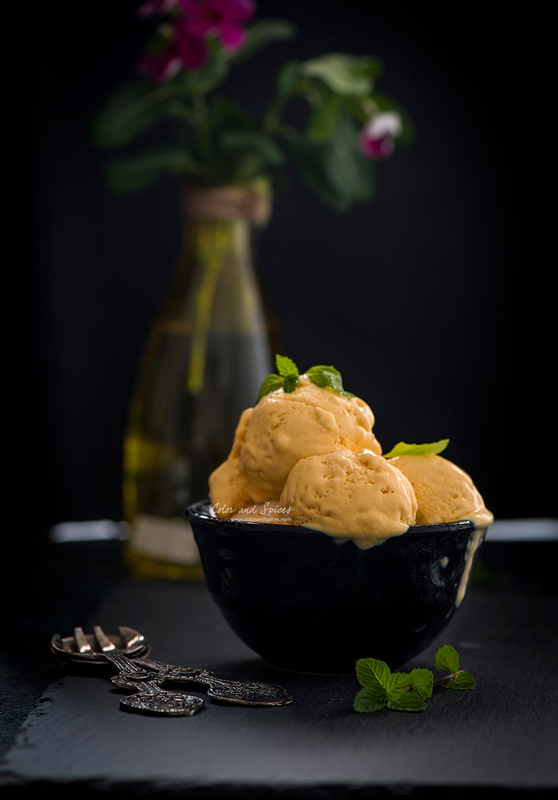 An ice cream recipe that doesn't involve any cooking, neither an ice cream maker nor any kind of fancy gadgets. 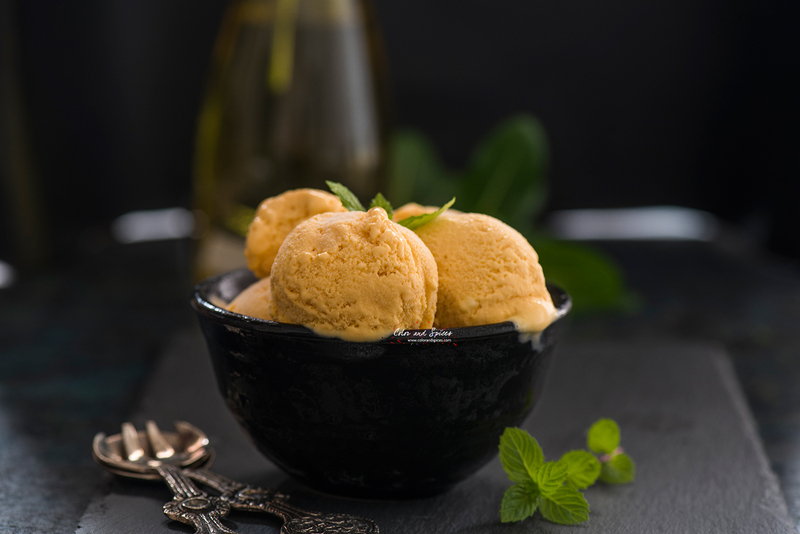 I prepared this creamy perfect ice cream with only three ingredients, and a wire whisk. The most common problem we face while making ice cream at home is it turns icy while freezing. There are many reasons for that. 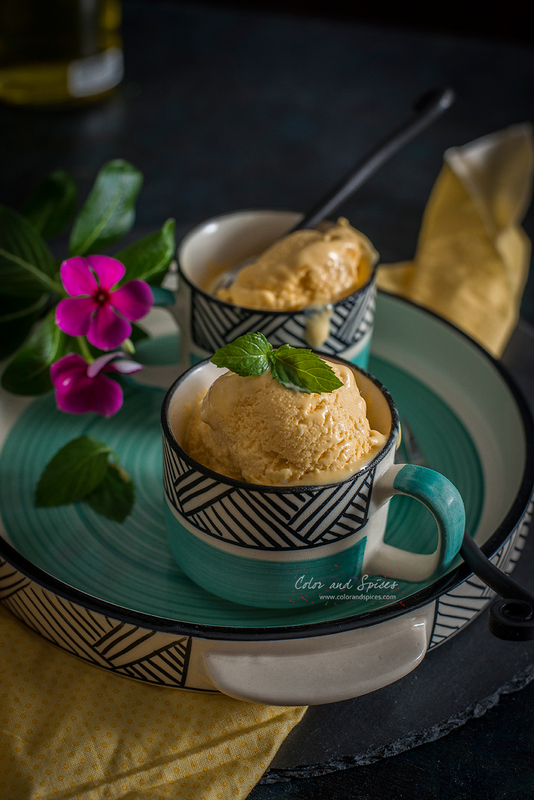 Go through my date palm jaggery ice cream recipe for the details. But this recipe is bit different as it doesn't involve making any ice cream base as such. I mixed all the ingredients and whipped it with a wire whisk. Yeah, it was a bit energy consuming, but was a good exercise for my arms. The problem I faced with the ice cream was during shooting the ice cream. I'm very finicky about my photography. I like to play with the entire set up and light for a long time before deciding the final arrangement. Though I chalk out the basic plan beforehand, but while working with the camera I believe in the creative instinct. But I must say one can never have time while shooting ice creams and that too in a 100% humid weather with 34 C (93 F) temperature. The ice cream was melting in no time. I felt so frustrated, but somehow managed to capture few images to share with you all. And that's my alibi of the melting ice cream images here. Like my daughter said to me, 'Ma ice creams are meant to melt so don't worry', as she licked clean the bowl of the ice cream. The ice cream tasted really good, the texture came perfect. 1. Take all the ingredients in a large bowl and whisk it with a wire whisk. As the mixture doubles up in volume, cover with a cling film and put it in the freezer. 2. After one hour take out the bowl from the freezer and again beat the mixture with the wire whisk. Repeat the process 3 to 4 times. 3. Cover the bowl and let freeze overnight. 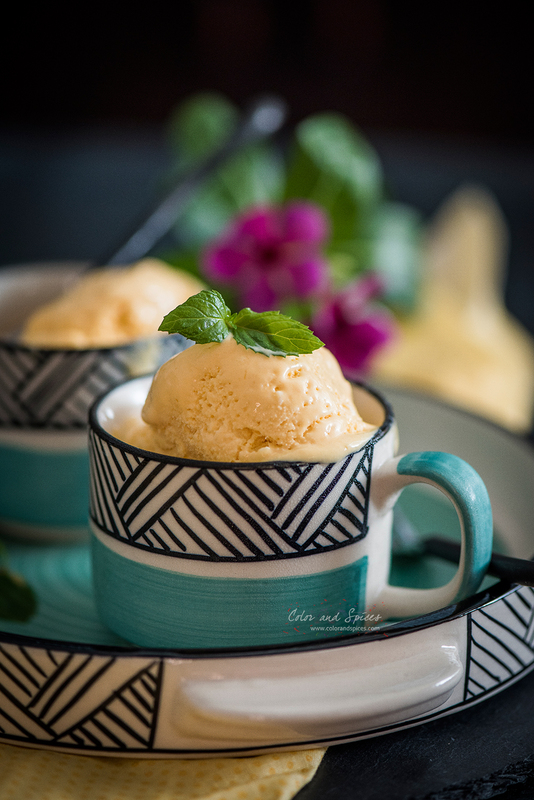 Serve chilled with mango cubes and mint leaves. Love this! Im going to try this for my mother. Can store brought frozen mango pulp be used? Yeah, you can use that. Taste the canned or frozen pulp whichever using and decide the amount of condensed milk to be added.